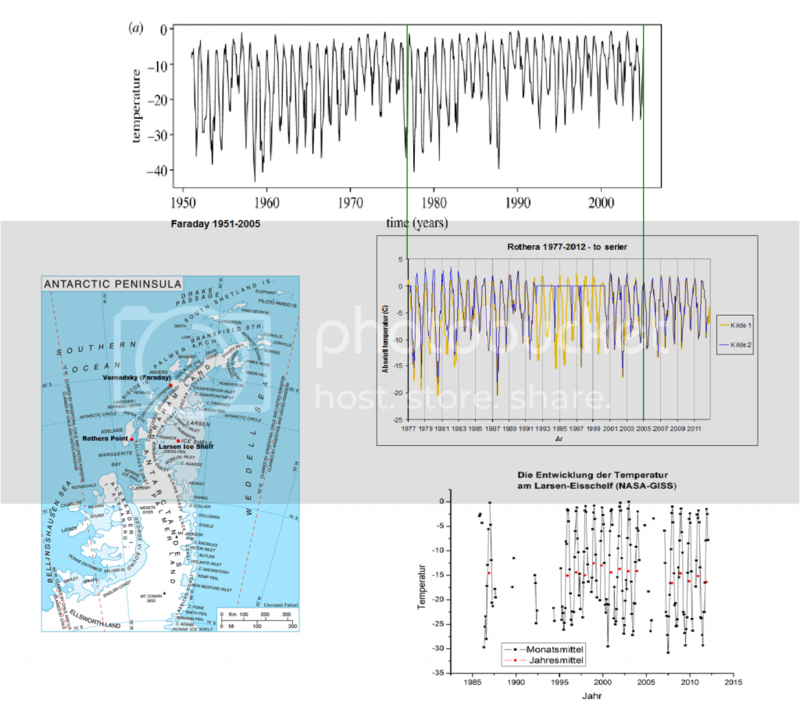 Antarctic summer effect confined to peninsula | Watts Up With That? 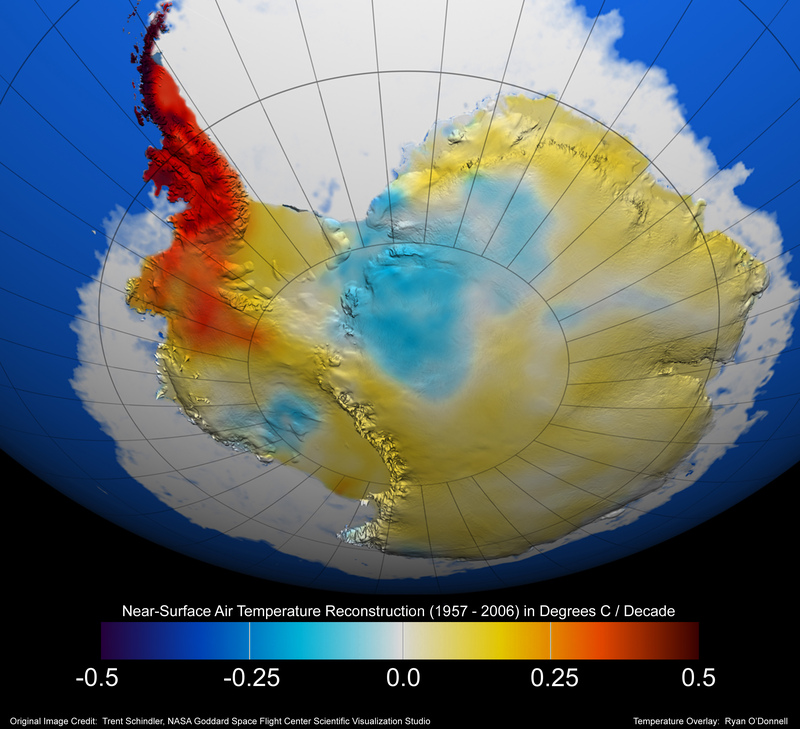 Summer melt season is getting longer on the Antarctic Peninsula, new research shows. New research from the Antarctic Peninsula shows that the summer melt season has been getting longer over the last 60 years. Increased summer melting has been linked to the rapid break-up of ice shelves in the area and rising sea level. The Antarctic Peninsula – a mountainous region extending northwards towards South America – is warming much faster than the rest of Antarctica. Temperatures have risen by up to 3 oC since the 1950s – three times more than the global average. This is a result of a strengthening of local westerly winds, causing warmer air from the sea to be pushed up and over the peninsula. In contrast to much of the rest of Antarctica, summer temperatures are high enough for snow to melt. This summer melting may have important effects. Meltwater may enlarge cracks in floating ice shelves which can contribute to their retreat or collapse. As a result, the speed at which glaciers flow towards the sea will be increased. Also, melting and refreezing causes snow layers to become thinner and more dense, affecting the height of the snow surface above sea level. Scientists need to know this so they can interpret satellite data correctly. To build up a more complete picture across the whole peninsula, the team (funded by the European Union’s ice2sea programme) also analysed satellite data collected by an instrument called a scatterometer. Using microwave reflections from the ice sheet surface, the scatterometer was able to detect the presence of meltwater. The team were able to produce maps of how the melt season varied from 1999 to 2009, and showed that several major ice shelf breakup events coincided with longer than usual melt seasons. This supports the theory that enlargement of cracks by meltwater is the main mechanism for ice shelf weakening and collapse. The researchers also compared data from both the satellite and weather stations with the output of a state-of-the-art regional climate model. Trends in Antarctic Peninsula surface melting conditions from observations and regional climate modeling will be officially published in the Journal of Geophysical Research this week. More summer melting would have nothing to do with more ice? The sea ice growth expanding out from the continent would naturally provide more ice to melt. Other than that, more models, whoopee.Colour me unenthused. and in another hundred years I guess we will be reading the same thing and the Antarctic ice will still be with us. any sea in wintry weather. The melting season is longer – how much longer? Is it one day, one week, one month or what? Reminds me of the headline a few years back that stated men over sixty five diagnosed with prostate cancer who did not get treatment were twice as likely to die from prostate cancer than those who did get treatment. Buried in the details were the statistics – 2% of those who did not get treatment died of prostate cancer while only 1% of those who received treatment died from prostate cancer. Either way, probability of death from the prostate cancer was much lower than death from heart attack, stroke, accident or whatever in men of that age group. So the melt season doubled at one station. From what to what did it double to? Five days to ten? 30 to 60? Without a context or baseline, the words are just a poor use of electrons. I will be curious to see if the MSM somehow manages to leave out the ‘Peninsula’ portion, and smear this across the entire continent anyway. Regional, not global. Oceanic and wind, not local CO2. Check the new sea-ice page that shows the Arctic Ocean by sub-basin pieces, Greenland Sea, Chukchi Sea etc. Look to open water by date: only the eastern portion has more open water. Looks like SST, ocean currents, not to-down, CO2-induced ice melt. Of course, SST could be atmosphere based temperature changes, but now we are one-step removed from CO2. Is Arctic ice loss top-down or bottom up dominated? Global atmospheric warming from CO2 should dominate and pre-date oceanic SST warming: top-down is CO2. SST temperature, not energy content, is what drives bottom-up melting (it is the temperature differential, not the heat capacity, that warms ice to melting-point). Presumably if big chunks of the ice sheet did not break off at regular intervals, it would continue growing until it reached Cape Horn. That would give the BAS something to write about. Having inspected the near-surface air temperature “records” from Palmer and other stations, I will just ignore reading anything ‘published’ in the Journal of ‘Geophysical’ Research or any other journal of the American ‘Geophysical’ Union for good reason. Well, last time I checked, the Antarctic Peninsula is outside the Antarctic Circle, which means that there never is a 24 hour night time there. The sun rises every day, just like clockwork. And, I do believe that researchers claim that Antarctica glaciers are running down hill faster than they used to, a likely consequence of the increased snow pack build up in the interior highlands. More glacial ice running off the edge of the land, will make for longer cantilevered ice shelves on the peninsula. These will jut further out into the Southern Ocean where the Atlantic and Pacific Oceans slosh back and forth twice a day, driving warmer ocean waters up under the ice sheles on the upstream side of the peninsula. Sooner or later, those extended shelves, are going to calve, and once the ice breaks off, then those same oceanic sloshes carry the ice to warmer waters; even up to New Zealand, so tourists can take a helicopter ride out and land on a big ice berg. Ho hum ! So we know that ice melts in the ocean, once ocean currents carry it away from the poles. Happens in the Arctic, and in the Antarctic, and in the near Antarctic, as in Antarctic Peninsula. Hey ! extra credit for guessing where all that snow pack and ice water came from originally, before it fell off into the ocean and melted. Guess hom much the sea level rises for each round trip, the water makes. Otter- The Canadian tv network CTV did indeed leave out peninsula and make it appear the whole of the Antarctica is melting, when in fact it is growing. That dark,dark red color sure makes it look like the Antarctic is on fire !! A whopping .5 C ? Change the color scheme a little bit and there wouldn’t be much concern. Anyone have any photo`s of this rising sea level. Item. Antarctic ice levels are well ABOVE normal. How does the author reconcile that fact with the above “linkage”. A simple analysis of the Antarctic peninsula (AP): observe that the summer ice increase is mainly to the east of the AP, while summer warming is on its west. So the temperature contrast between east and west has increased — there’s a mountain range running down the middle, you know — so it’s likely that wind conditions and the mountainous separator have sharpened the micro-climates there. The average temperature over all of it is likely to be little changed. A similar contrast has happened in the Arctic this year, over Nova Zemlya — a long thin mountainous island. Temperatures to its west have been moderate and ice thin — but to the east, over the Kara Sea, very low temperatures and thick ice. Nova Zemlya’s mountains have kept these microclimates separate. Expect the Kara Sea ice to hang on grimly this coming summer, to melt out end-July or early August — my own prediction. I refer you to a previous post here on WUWT… the preponderance of Volcanoes on the peninsula… not even mentioned in the post above… I’m not saying they may be more active… but the question is, are they? The thing that never gets discussed in all this talk of AP melting, is the ice sheets that are ‘melting’ are the Larsen icesheets (A, B & C) on the east side of the Peninsula. These icesheets are surrounded by 200km of sea ice that never melts and is currently at its largest summer minimum extent ever recorded. Strong evidence that temperatures to the east of the peninsula are in fact decreasing. How come the icesheets melt and the sea ice that surrounds them doesn’t? Warmer air temperatures should melt both equally. I’d add that an increase in westerlies over the peninsula would result in increased foehn winds on the east side of the peninsula, which would result in higher temperatures over the Larsen icesheets, but not over the sea ice further out. Foehn winds probably play a significant role in icesheet melt, but have nothing to do with GHG atmospheric warming. Norm, as you know, CTV is a Thomson Reuters network, thus biased to green mongering interests (Crispin Tickell etc…). Warmer air and moister air too explaining high snowfall rates there too. The late Marcel Leroux had explained this dynamic warming of the Peninsula long before this article. Yet, it is funny that the press release does not elaborate about the strengthening of these westerlies, and the deepening of the depressions associated to more frequent expulsions of mobile polar highs that are a consequence of the cooling of the rest of Antarctica. But I guess for BAS, it would seriously undermine their research funding cash cow: CAGW. In support of J.B.’s above comment. Howdy. Good to hear from you again. Looking forward to your comments concerning up coming Arctic cooling and increased Arctic sea ice. The extreme AGW paradigm pushers preferred to discuss the ‘summer’ warming of the Antarctic peninsula (there is now a cold anomaly in the winter over the Antarctic peninsula which is logical as Antarctic sea ice is now high for both summer and winter. Rapid warming over the past 50 years on the Antarctic Peninsula is associated with the collapse of a number of ice shelves and accelerating glacier mass loss1, 2, 3, 4, 5, 6, 7. In contrast, warming has been comparatively modest over West Antarctica and significant changes have not been observed over most of East Antarctica8, 9, (and William the majority of the Antarctic continent has cooled, and sea ice around the Antarctic is at a record high) suggesting that the ice-core palaeoclimate records available from these areas may not be representative of the climate history of the Antarctic Peninsula. Here we show that the Antarctic Peninsula experienced an early-Holocene warm period followed by stable temperatures, from about 9,200 to 2,500 years ago, that were similar to modern-day levels. Our temperature estimates are based on an ice-core record of deuterium variations from James Ross Island, off the northeastern tip of the Antarctic Peninsula. We find that the late-Holocene development of ice shelves near James Ross Island was coincident with pronounced cooling from 2,500 to 600 years ago. This cooling was part of a millennial-scale climate excursion with opposing anomalies on the eastern and western sides of the Antarctic Peninsula. Although warming of the northeastern Antarctic Peninsula began around 600 years ago, the high rate of warming over the past century is unusual (but not unprecedented) in the context of natural climate variability over the past two millennia. 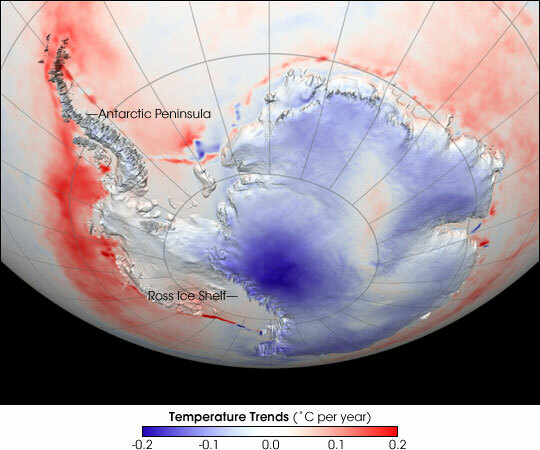 The connection shown here between past temperature and ice-shelf stability suggests that warming for several centuries rendered ice shelves on the northeastern Antarctic Peninsula vulnerable to collapse. Continued warming to temperatures that now exceed the stable conditions of most of the Holocene epoch is likely to cause ice-shelf instability to encroach farther southward along the Antarctic Peninsula. Antrctic melting period is getting longer , Arctic melting is shortening. While Antarctic remains well below 6 month line , Arctic has recently crossed it. I don’t know whether that is a significant threshold or not but then tendency is clear at both ends. Sea ice has be increasing in the antarctic over the last few years. Just look at the sea ice page. This is once again a case of only telling one part of the ‘truth’, the one supporting your agenda. It might very well be that the summer melt season on the AP has gotten much longer during the last 50-60 years and that the peninsula on average has gotten warmer, perhaps even a lot warmer, over that same period. But there is no indication of this warming continuing to this day. Not at all. This warming occurred somewhen between 30 and 45 years ago, depending on what data you’re looking at. Nothing of substance has happened temperaturewise during the last decades, the modern era of ‘global warming’. Lower graph: Temperatures at Larsen Ice Shelf since 1985. No visible upward tendency. Rather the opposite. Middle graph: Temperatures at Rothera Point (see map) since 1977. Since about 1981-83, no discernible increase. I can only assume the temperatures plotted are minimum temperatures, for they match pretty close the minimum temperatures at Vernadsky (Faraday) station (upper graph). At Vernadsky you can draw a line all the way back to 1970-71 without seeing much temperature rise to the present. Maximum vs. minimum temperatures at Vernadsky (Faraday) station, 1951-2005. The maximum temperatures don’t exactly exhibit much of a rise over the past decades, do they? It appears most (if not all) of the rise in AP mean temperatures over the last 60 years can be attributed to the marked upward shift in minimum temperatures in the late 60s to early 70s. And besides a few ups and downs along the way, not much of consequence has happened since, especially not during the last 30 years. The alleged AP warming is a hype, a myth, at best a half-truth, at worst a bald-faced lie. It is the 62nd consecutive day with higher than average global sea ice cover (relative to the 1979-2008 mean) and counting. Who can forget RealGore’s pics of the Larsen Ice Shelf breaking up? Well, buzz on down there by Google Earth, and you will find it is reforming. Could breakup have been the result of gravity, not climate? I agree that the melt season for the arctic has increased over the years, mostly due to increased global temperature from increased CO2 emissions. In a current lecture I went to held by Dr. Ryan L. Fogt he told of his studies in the Antarctic and how they have found that the ice sheets have been reducing over the years. His research started in 2002 and from then to 2012 there has been a significant loss in the ice sheets of the Arctic. A case he specifically focused on was the Larsen B ice shelf on the Antarctic Peninsula that broke up that just from January 31, 2002 to March 5, 2002. The Antarctic ozone has been depleting, and in 2006 there was an all-time record ozone hole area of 27 million km^2 (ozonewatch.gsfc.nasa.gov). Westerly winds may be a cause in the reduction of ice sheets and increased melt water that could be splitting up the glaciers, but increased global temperature is a significant cause too. This article needs more facts though to back it up. Like, by how much has the summer melt season increase over the last 60 years? Did it increase steadily over the 60 years or did it shoot up particularly over certain years? Without this specific data the statements in this article cannot be taken too seriously.